Creator God, we are reminded today that new life and everlasting hope are found in you, the one who birthed all of creation and continues to care for all within it. We give you thanks for your on-going invitation to be co-laborers with you in this world you made good and beautiful. We are grateful on this day that as a mother cares for her children, so also have you extended compassion towards us and cared for us as your people. May your Spirit enable us to extend the same love and concern towards others in their seasons of joy and sorrow. Help us to laugh with those who laugh. Weep with those who weep. And rejoice with those who rejoice. On this day, we especially lift up to you all those who are mothers. We pray for those who know the joy of new life coming into this world and faithfully love and care for their families as you love and care for us. We pray for mothers who have adopted or are in the process of adoption, extending their families to children in need of a place to call home. We are reminded that in the same way you claim us as your children and call us to make our home in you. God of comfort, your Word reminds us that creation groans as though in the pains of labor, waiting for the world to be made right. We continue to await the day when all will be made right. Until then, we grieve this day for all those who long to be mothers but for whatever reasons, known and unknown, have yet to see that day come. We pray for those who have battled endlessly through infertility, miscarriage, and reproductive technology, knowing all too well that pregnancy is never to be taken for granted. We pray for those who have lost children to a world still muddled with chaos. We pray for the children throughout this world who long for someone to call mother. Make a way for them to enter into a family and a home, even through your church. 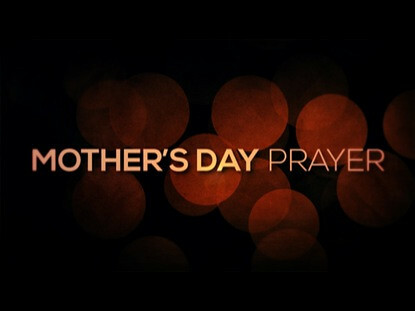 We pray for those who also have lost mothers and grieve the passing of other loved ones. Make your compassion and concern known to all for whom Mother's Day is no longer a day to celebrate. Jesus, you are the one we call brother and friend. We are grateful that in your life, death, and resurrection we discover new reasons to hope and the ability to trust God’s promises that are to us and for the whole world. Remind us over and again- we are your people and nothing and no one can separate us from the love you have for us. In that light, continue to form us as your children, so we may be your light into the world. Walk with us towards the day when you will make a home among us and all the families of the earth will be united forever. Amen.